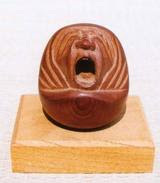 Bodhidharma's years of meditation are represented with images of a seated monk facing a cave-wall called "Wall gazing" (Menpeki Daruma 面壁達磨). Related are depictions of the disciple Hui-ke presenting his cut-off arm (*Eka Dampi 慧可断臂) as a sign of his serious desire to study meditation with the Indian master. On occasion, Zen artists combine Daruma and enso into one image as we see in this piece (Figure 7) by Seiin Onjiku (1767 -1830). Normally with such an inscription: "Who said, 'My heart is like the autumn moon?"' The enso would be placed at the top of the paper; here, however, Seiin has set the moon-mind at the bottom to represent Daruma "wall-gazing" (mempeki), illumined by the moonbeams of enlightenment. Further, the inscription reminds us that, despite vast differences in time and place, the minds of the Patriarch, the Chinese poet Han-shan (to whom the verse refers), the Japanese monk who created the painting, and that of the modern viewer are essentially the same. Totally unaffected, Seiin's brushwork is soft and warm and the bokki radiates gentle light. CLICK for more photos . By this way, here are many more Hakata Dolls with Daruma and a few other famous figures. Do not miss a quick look here. Even Charlie Chaplin is here in the last row. 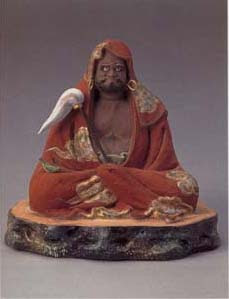 Bodhidharma was born in Kanchi in the Southern Indian kingdom of Pallava between 440 and 470. His spiritual instructor was the monk Prajnatara. He told him to travel to China and he came there by ship somewhere between 475 to 520. 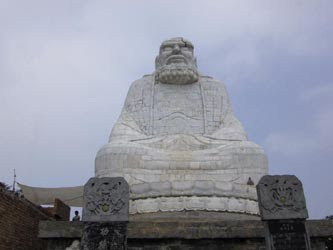 Legend has it that he spent nine years in meditation, where he used to sit facing the rock wall of a cave that's about a mile from the Shaolin Temple. Thus he won the title "the wall-gazing brahmin". "The buddha in the mind is like a fragrance in a tree. The buddha comes from a mind free of suffering, just as a fragrance comes from a tree free of decay. There's no fragrance without a tree and no buddha without the mind. If there's a fragrance without a tree it's a different fragrance. If there's a buddha without your mind, it's a different buddha." Click on the .jpg here to see the pictures. The place in China where Daruma practiced austerities. See my Photo Album, Pictures Nr. 41 to 52, start here. Enlightenment is the singular taste (of Zen). And nature flourishes like the evergreen pine. traverse deep valleys and all will be well. 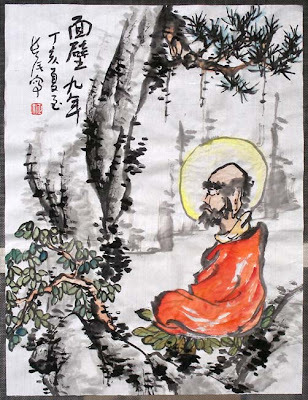 Bodhidharma himself is said to have taught, "If you wish to cast aside the false and return to true, concentrate and settle your mind in wall-gazing. Self and other, the unenlightened and the saintly are all as one. Abide securely in this and do not stray." The Hsin hsin ming (Inscription on Having Faith in the Mind) attributed to the third patriarch, Seng-ts'an (d. 606), states: "The two come when there is [a notion of] one[ness], so oneness also must not be adhered to. When a single thought does not arise, the myriad things are without defect." And again, "All wise ones throughout the ten directions penetrate this essential truth; this essential [moment of] truth is neither pressingly short nor lengthy. An instant of thought is ten thousand years." 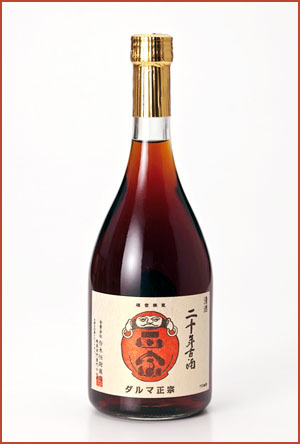 there is even a Sake ricewine called “menpeki kunen” . I tried it of course and can highly recommend it after nine years of looking at the "gamen" of my computer. In Issa's time sansuke was a manservant or an attendant in a bathhouse. 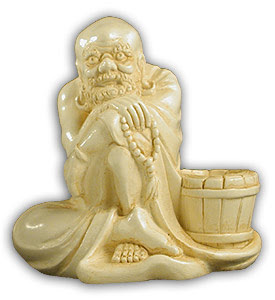 If he is a bathhouse servant, his "sitting Zen meditation facing a wall" (mempeki) might indicate a lack of customers; the Fifth Month rains have kept people away. "Fifth Month rain" (samidare) pertains to the old lunar calendar; it would be June rain in the present calendar.